Behind the sharp-dressed men of Suits is the even sharper eye of Jolie Andreatta, the costume designer responsible for making Mike Ross (Patrick J. Adams) and Harvey Specter (Gabriel Macht) look so good. 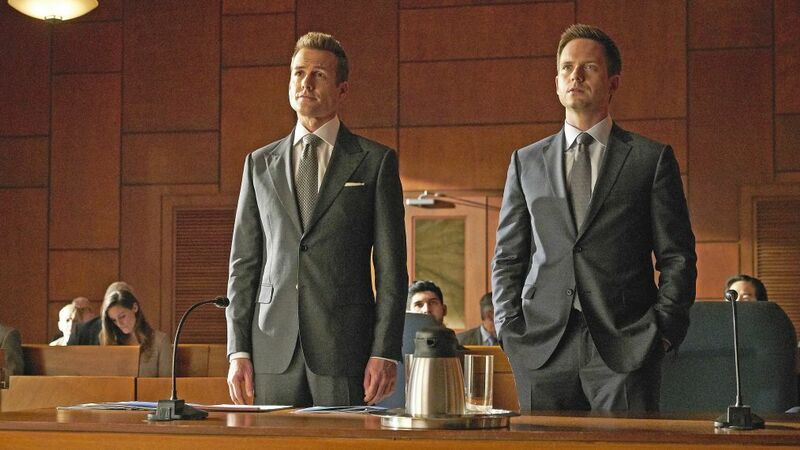 And it’s evident from the legal drama’s always-dapper duo that Andreatta has acquitted herself quite nicely. Is working on a show named Suits a dream come true for a costume designer? It truly is, honey. Producer Randi Richmond, who I did Hollywood Wives: The New Generation with up in Toronto, brought me in on the fourth episode. I was looking for a place to feature fashion, and here it is! Is it true that all of the suits Gabriel Macht wears are designed by Tom Ford? Not exactly. We use Tom Ford suits and then we make suits inspired by Tom Ford. We use our own patterns to create a skinnier cut, or I’ve changed them to where we’ll have four buttons or the lapel will be smaller and lower. Sometimes Gabriel will want a two-button versus the four-button, so we’re playing with a few different variations of that design, but always staying with the [Tom Ford] peak lapel. Mike is now a legitimate lawyer. Did that inform how you dress him this season? Oh, yeah. When he was at the legal clinic last year, he was wearing separates with a little texture. At the firm, Pearson Specter Litt, he will be more sophisticated. He’s definitely grown up, so we’ll see him in more classic cuts. How big are their wardrobes? We probably have about 50 suits for each of the two leads, whether they’re still in circulation or not. Because of the dry cleaning, we go through a suit a lot quicker than a normal person would. I’d say each year they get anywhere from 10 to 15 new suits. Who’s the fashion plate of the cast? All of them! They’ve learned so much from this that they’re really professional tailors, except they don’t have to do the work. [Laughs] They know labels. They know designers. They know what looks good on their bodies.